Until the Civil War, coastal Georgia and South Carolina thrived as the country’s premiere rice growing region. Many of the South’s great rice plantations were destroyed during the Civil War, but a few still stand today. Located between Darien and Brunswick, Georgia, Hofwyl-Broadfield Plantation offers a fascinating window into the Lowcountry’s 19th-century rice culture. Situated south of the Altamaha River along a narrow stretch of land that was ideal for rice cultivation, Hofwyl-Broadfield Plantation produced thousands of bushels of rice during its heyday. In fact, the plantation had its own rice mill, an unusual luxury since only the largest and most prosperous plantations had their own mill. The tabby ruins of the Hofwyl-Broadfield’s rice mill, which overlook the marsh that once served as rice fields, can be seen on a tour of the plantation. Constructed in the nineteenth century, flood gates called “trunks” allowed the incoming tide to flood the fields and would be closed at low tide to hold the water in the rice fields. When the rice fields were flooded, foot travel was restricted to earthen paths along the top of the dikes. During unusually high tides, brackish water could contaminate and destroy the fields, since salt water is deadly to rice, but the fresh marsh water nourished the rice crops that sustained a large part of the Lowcountry’s economy. The plantation began in the early 1800’s, when William Brailsford and his son-in-law James M. Troup acquired several thousand acres of virgin cypress swamps along Georgia’s Altamaha River that they converted to rice fields with the help of several hundred slaves. Brailsford named the enormous rice plantation “Broadfield” but the name “Hofwyl,” the agricultural school Dent attended in Switzerland, was added in the 1850’s when Ophelia Troup and her husband, George Dent, built the plantation house that stands today on the plantation site. The antebellum plantation house, which features modified windows to enhance circulation and original furnishings owned by the Dent family, is a relatively simple white structure that housed the plantation owners from early fall to late spring. During the heat of summer, when the danger of malaria and swamp miasma disease was at its height, planter families typically retreated to their summer homes in cooler climates, leaving their slaves and an overseer to tend to the crops. Today, the grounds are planted with camellias, wisteria, magnolias, palms and enormous live oaks that trace their roots back hundreds of years. Upon her death in 1973, Ophelia Dent bequeathed Hofwyl-Broadfield to the Nature Conservancy. The plantation, considered a state historic site, is currently under the supervision of the Georgia Department of Natural Resources. A variety of wildlife make their home on the Hofwyl-Broadfield Plantation, including crabs, raccoons, and wild hogs. Hawks, osprey, bald eagles and other waterfowl and birds of prey can often be seen circling above the coastal marsh. 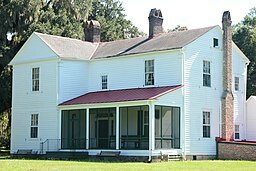 Hofwyl-Broadfield Plantation is located on U.S. 17, one mile east of I-95, six miles south of Darien and 10 miles north of Brunswick, Georgia. The plantation is open Wednesday through Sunday from 9 a.m. to 5 p.m. For more information, visit gastateparks.org/HofwylBroadfieldPlantation.